I originally planned to make a chicken curry soup in the crock pot yesterday. Unfortunately it rained. When it rains Little B and I usually go outside and splash around in puddles and follow the path the water takes from the ditches to the creek. Don’t worry grandmothers. We don’t go cavorting when there is lightning or thunder, and we watch the flowing water from above. Our rainy adventure took much longer than originally planned, so there was not enough time before dinner to cook the soup slowly the way I like it. I will do it another day. There was time to layer up a casserole and get it baked, and my hankering for curry was humming away, so I checked out the fridge and pantry. I am working on improving my ratio of vegetables to meat, in that I want to eat mostly vegetables and a moderate amount of meat. I love meat, but it is loaded with calories. I don’t ever expect to completely remove meat from my diet, but eating less of it could not hurt. The following is an attempt at improving the veggie/meat ratio without leaving me hungry an hour later. Preheat oven to 325F. Grease a 9”x13” baking dish. Use half the potato slices to make a layer on the bottom of the dish, completely covering it by overlapping the slices. Lightly salt and pepper the potatoes. Add a mixed layer of the cauliflower, broccoli and baby carrots, topping with the chopped garlic. Sprinkle half the curry powder over the vegetables. 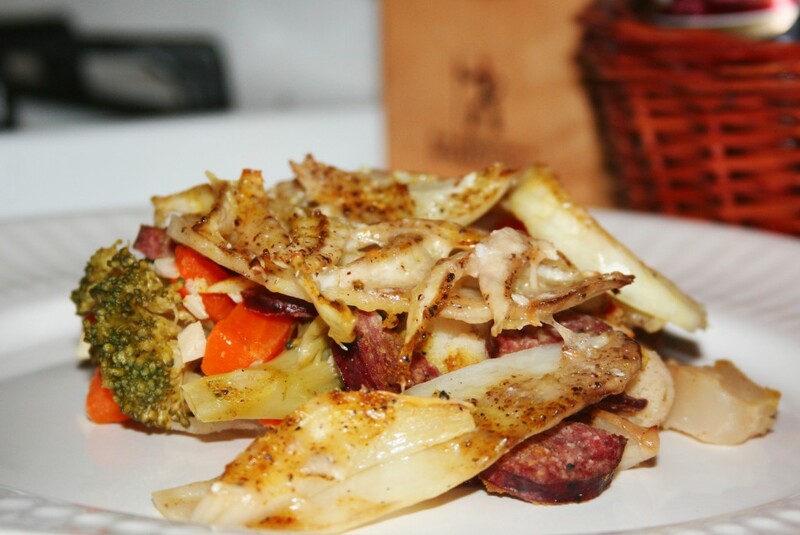 Sprinkle the sausage slices on top of the vegetables. Add another layer of potato with the remaining slices. Finish with a layer of onions. Pour the broth over the onions, making sure it gets evenly distributed. Drizzle the olive oil over the top, along with some salt, pepper and the rest of the curry powder. Cook covered for one hour. Uncover and sprinkle with cheese. Cook an additional 30 minutes until brown on top. Let rest for about 10 minutes before serving. This dish is a huge, gluttonous monstrosity. It is meant to be. I combined a couple of comfort foods into one dish. I will explain. Big D makes chili and is really good at it. He uses three kinds of chilies – including powerful chipotles – along with onion, garlic, cumin and stew meat, as well as tomatoes, secret ingredients and sometimes some beer. He starts it in the morning in our well seasoned iron dutch oven. It simmers on the stove top all day, making the house smell like the Mexican restaurants I frequented when growing up in San Antonio. He stirs it, adds some of this and that, tastes it, stirs it some more. The result bursts with a smoky, spicy flavor that does not reveal its heat until about five bites into your meal. We always have leftovers that just don’t taste the same after they have been frozen, so there is always an urgency to eat it for days until it is all gone. I can eat bowl after bowl of it topped with cheese, sour cream and cornbread, but I get to a point when I look forward to the flavor, while also wanting some variety. The other day we had some chili in the fridge, but I was craving a casserole. 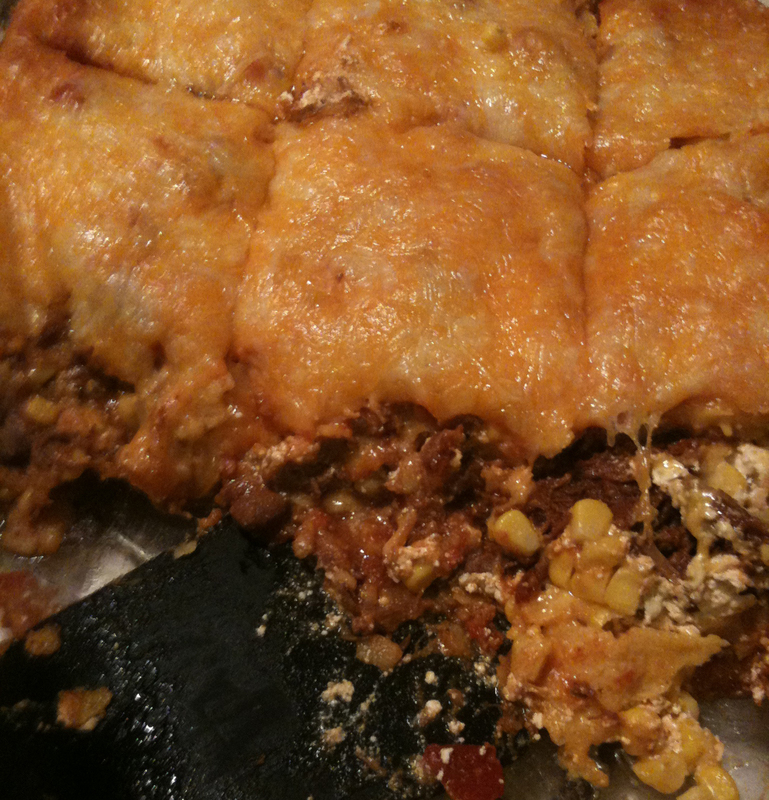 I was actually craving a casserole my mom used to make – layered enchiladas. I recall it had corn tortillas, ground beef, cheese, some mixture of sour cream and condensed soup, onions and tomatoes. My brother and I would gobble up a plate full of the casserole somewhere between school, soccer practice and homework. It was so good. I wanted the flavor of Big D’s chili and the texture of my mom’s casserole. I can do that. I know I can! Necessity is the mother of invention, although there is debate as to who first made such a declaration. My craving necessitated a casserole, so I made one. This casserole adds some variety to our menu, freezes well, and stretches out a batch of chili. Warning: Big D’s chili is usually thick and meaty, so if you try to use a watery canned chili I don’t want to know about it and cannot guarantee your results. Preheat oven to 350F. Grease 9×11 casserole dish. Add 1/2 cup of the salsa in the bottom of the dish and cover with 4-6 tortillas. Make sure the bottom of the dish is completely covered by overlapping the tortillas. Use half of the chili to make an even layer on top of the tortillas. Follow the chili with half the sour cream, 1 cup corn, 1 cup beans and about a cup of cheese. Continue by repeating once again the layers, ending with a top layer of tortillas. Cover the top tortillas with the remaining salsa and cheese. Bake covered for 30 minutes, then uncovered for 10-20 minutes until hot and bubbly.